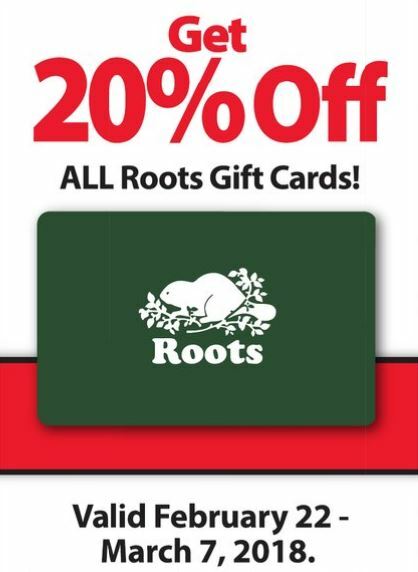 Planning some shopping at Roots soon? Buy a discounted gift card from Fortinos if you live in the GTA and save 20%. It is a great time to stock up on discounted gift cards ahead of their usual customer appreciation sale in April. The sale usually has 25-30% off almost everything in the store. Use the gift card to save an extra 20% and make your deal even hotter. Gift cards in Ontario have no expiry date, so you can even keep them for the big sweat sale at the end of summer. I like to pick up cards I know I will use while they are 20% off because who wants to pay full price? This deal is valid starting tomorrow though March 7th. See the Fortinos flyer for this offer here.